Brief Synopsis – A young man living in the slums of the city is hired by a rich man to care for him after he is paralyzed in a freak accident. My Take on it – This is a film that I’ve been interested in seeing for years yet never got around to it because of my dislike of foreign language films. Since I have been trying lately to overcome that “prejudice”, I decided to try watching more films not in English and see what I’ve been “missing” out on over the years. 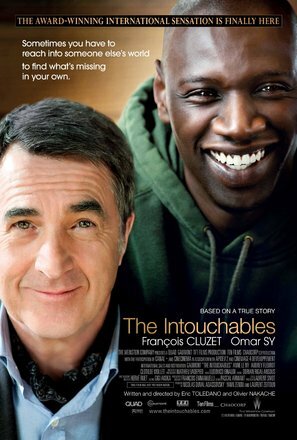 This is a film that is a great story about a friendship that slowly forms between two very different men who come from diverse backgrounds yet find a way to achieve a meaningful dialogue towards one another. Their values and socioeconomic standings are so diverse yet this film shows that true friendships can find the gap between the two. This film does a nice job showing how their friendship grows as they start to get to know each other and it all comes across as feeling quite genuine. The cast is great and even though I wasn’t familiar with either of the lead actors ion the film, I felt that they did a great job of keeping things feeling and looking realistic. The fact that this is based on a true story also says so much about the story which shows hope eve when people believe they are trapped in the world that they live in. Bottom Line – Great film about friendship even between men who is so different in values and also in their socioeconomic standings. The way that the film shows how they get to know one another better and eventually become quite close is great. Cast is great and help make things look and feel quite realistic. Recommended!